NEW 29. 1. 2019: Online Conference Proceedings 2017 and 2018 (11 th and 12th International Days of Statistics and Economics) has been included into Conference Proceedings Citation Index (CPCI) which is integrated index within Web of Science, Clarivate Analytics. 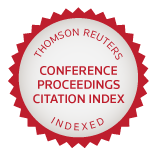 Online Conference Proceedings 2011 - 2018 have been included into Conference Proceedings Citation Index (CPCI) which is integrated index within Web of Science, Clarivate Analytics. The papers from Online Conference Proceedings are indexed in the Google Scholar.